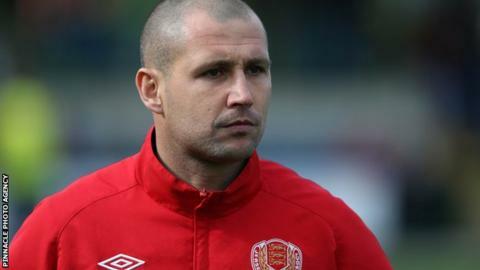 Jersey manager Craig Culkin and his assistant Dave Kennedy are to help the England C team in their match in Albania next week. The trip is part of Jersey's planning before they represent England in the Uefa Regions Cup in San Marino. "It should get us familiar with how the England preparation is going to run," Culkin told BBC South West Sport. "It'll give us an insight into styles of play and some of the coaching methods being employed at that level." The England C team is the select side for players based outside of the Football League, drawing most of its talent from the Blue Square Bet Premier. And the Jersey boss, who was once on the books of Celtic, says he hopes he is able to bring back some good tips for both him and the rest of island football. "For me it's a constant learning curve," he said. "Going back to my former professional days coaching in football at times can be a science. "It's good to see the other side of it operationally in terms of the structure, the medical side of things, sports science and support. "It's going to be the finer things we'll be looking at and hoping to take on the positive aspects of the environment into the Jersey set-up when we return." Jersey in November before the in March. "We're working towards trying to secure a fixture against England C at St George's Park or in Jersey before we go to San Marino," added Culkin. "Any game is crucial for what the next few months hold."